For your kiddos! 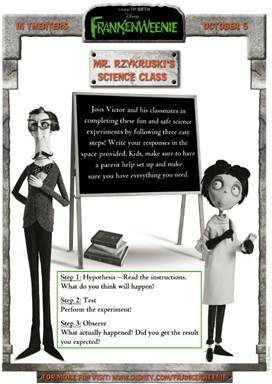 Frankenweenie Science Experiment Activity sheets! <=====Click the link and print them out. This will be perfect. My grandkids live far away, and I am always searching for coloring and activity sheets to send to them. Kids enjoy getting mail, and it makes me feel good to to be a contributing factor in their lives. I just started looking at Halloween ones, and this will go great with the other sheets I’ve printed. this will keep ’em entertained! Love this. I babysit a four year old and he loves to make a mess, how fun would a experiment sound to him! Thank you, will deff use this for him! These are adorable! I am sending the link to my nieces and nephews right now!